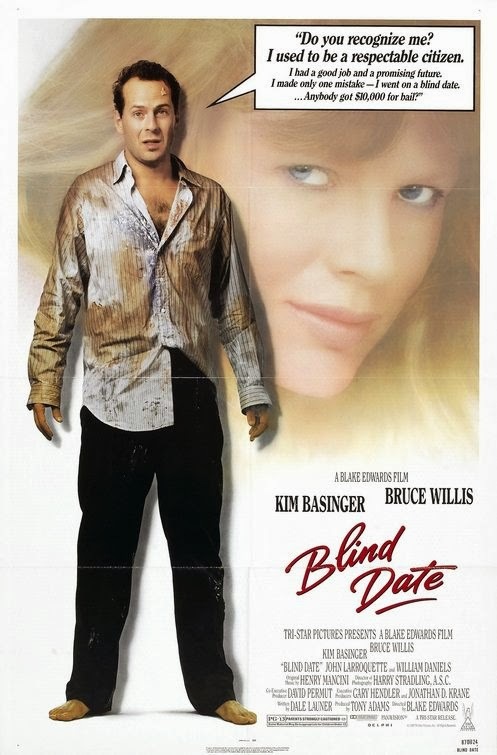 Finally I got to see Blind Date and why Bruce Willis was having such a bad day. Apparently Kim Bassinger's character Nadine loses control after drinking alcohol. How much and to what extent we is what provides the most jokes. And while the events certainly were comedic I have to say that I expected more. Blake Edwards was a master in slapstick comedy but in this one it felt lackluster. The cast is doing their best but somehow they don't get backed up properly. The love angle doesn't make sense at all. If some chemistry was present between Kim Bassinger and Bruce Willis I could have understood their romance. From the events we are witness off it never really becomes clear why Bruce Willis is so enchanted by this crazy lady. Of course there is her beauty. But knockout gorgeous, no chance! The one sweet thing she does could also be more a case of guilt than love. Only that doesn't seem to matter to Bruce. To me it felt like there were key scenes missing that would have made me like them more and that I could have bought them as a couple. Still it is not the worst I have seen. It is adequate enough and did not feel like a waste of time. Worth a watch if only to see Bruce Willis being super charming like he was in Moonlighting.